Home » Crafts, Sewing, & Home Decor » Sewing » Brand New Sponsor and Fantastic Giveaway! Brand New Sponsor and Fantastic Giveaway! You’re going to love my newest sponsor. 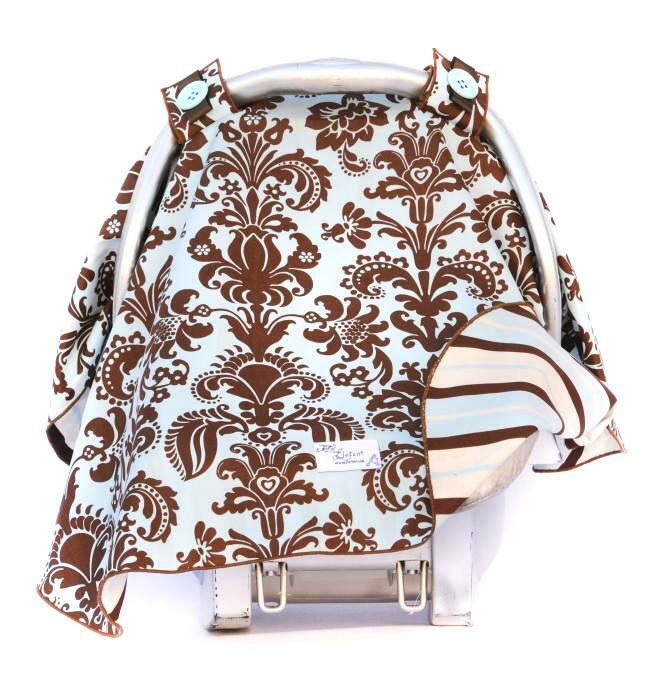 EleTent is a great little shop, filled with a large variety of the sweetest little car seat tents…..perfect for keeping those little ones covered and protected, without being smothered. 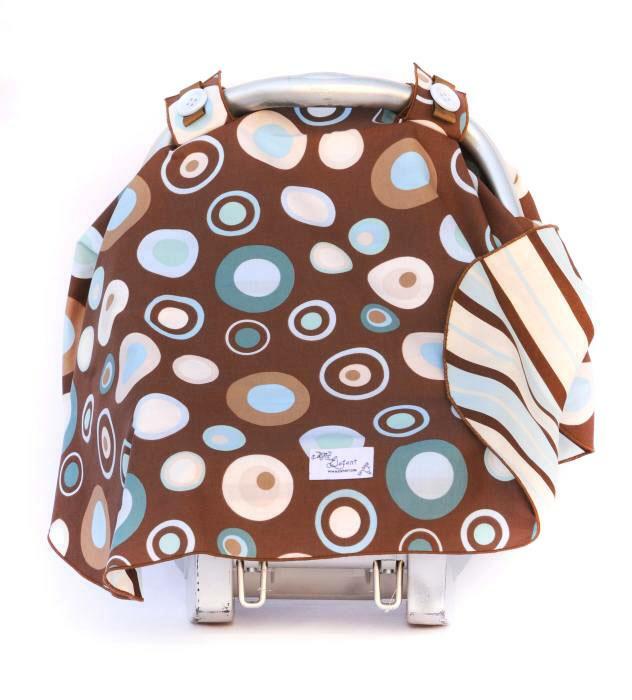 And these tents are made with precision, to attach to all car seat styles with two velcro straps at the top. Nice and convenient. 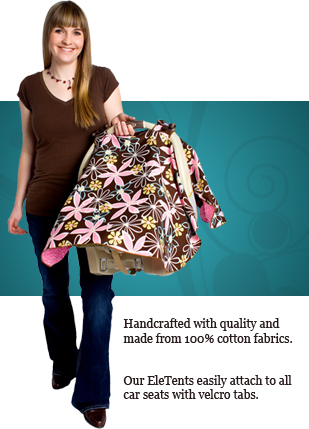 All tents are made from 2 coordinating sides of beautiful designer fabrics. Just check out some of the options. And I love that there are plenty of girl and boy options. 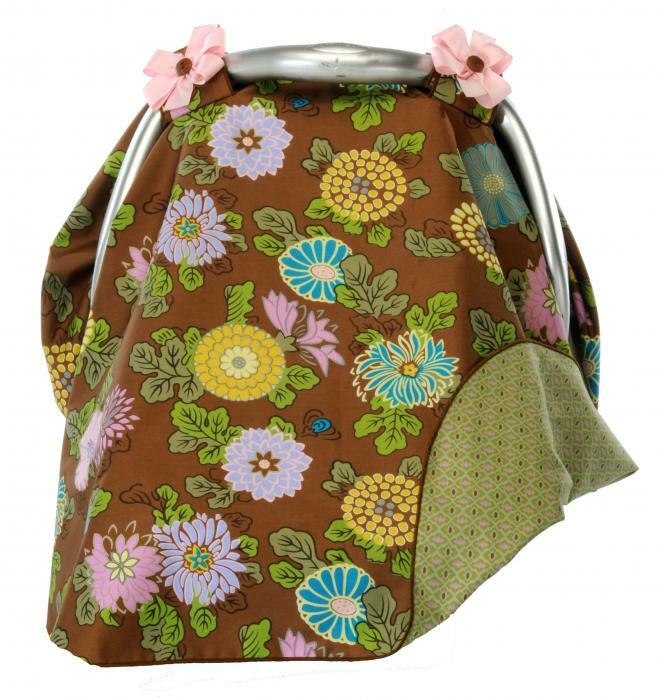 And my goodness, I love that little flower detail atop each velcro closure on many of the girly styles. Darling. And a really great addition to the shop, is the nursing strap clips. Eletent custom creates a neck strap with clips on each end that coordinates with your tent. You can easily fold your tent in half, attach the strap around your neck, attach the clips the the tent, and you’ve got yourself a nursing cover. Genius. 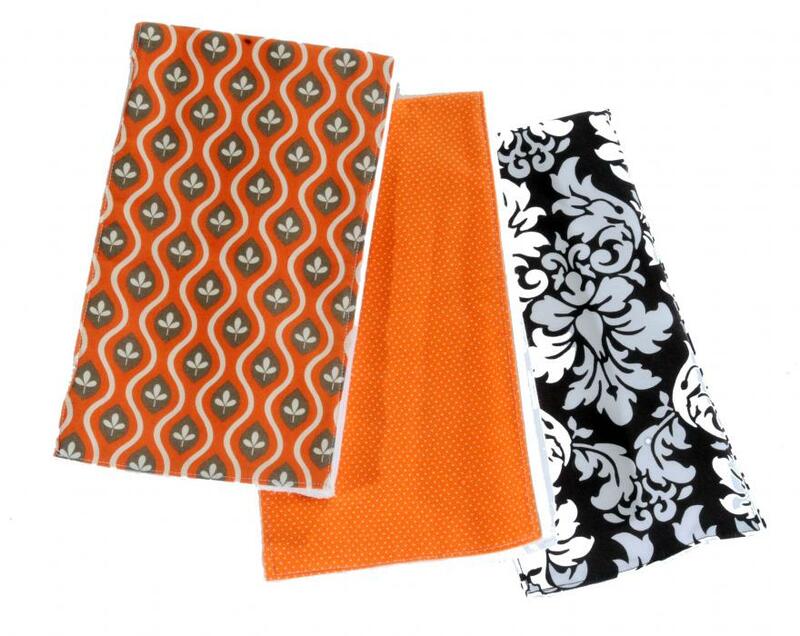 And don’t forget those matching burp cloths. What a sweet little set that you can have custom made to match your set, or choose any color combo you’d like. Perfect. Don’t you just love the style and charm of those little tents? 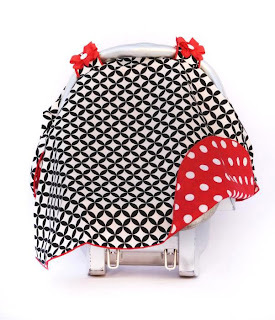 What a fun and darling way to cover those sweet little babies. Eeeeh, gets me excited for my own baby. And yes, EleTent has decided to do a giveaway here on Make It and Love It. They are offering a $50 gift certificate to one of you. Hooray……just think of what you could bring home to use on your own baby!! Or even gift to a friend. **Also, EleTent is offering a 10% discount off all orders. Enter “makeit” at checkout to receive your discount. Visit EleTent here, check out the site and browse around for a bit, and then choose your very favorite item(s) over on the site. Then come back and let me know what you like, in one comment. Be sure to leave your email address so that I can contact you if you’ve won. Returning Sponsor and FANTASTIC giveaway!! How fun… I love the eletents for sure, and the Blue Damask is my favorite! I LOVE the eletents, I love the courtney and the rock star one!! I due in March and will DEFINITELY be getting one of those amazing eletents!!! The one with the little elephants, etc… is my favorite – what a GREAT IDEA! Eletents are the Best!!!! So many I like, but the Blue Damask would be my #1 pick!!!! Great Giveaway!!!! I absolutely love the pink posy. It would be so perfect for when we take baby case home to Indiana! What a great idea! I love the pink damask, they are all such great colors and prints! I love the chinese flower! My friend is having a baby in February…living in Canada car seat covers are essential! Ooops, this time I'll remember to include my fav item: the Courtney! I love them all, but I'd have to go with the Blue Damask as my favorite! Oh I love everything she has to offer! I think my favorite though is Rock Star EleTent! I love the cotton candy style…and the clips are genius! How handy! So cute!! I have a baby shower coming up for my sister-in-law and she would love something custom!! I like the cotton candy eletent. Its super cute. I like the turquoise and orange eletent! Very cute! I like the Fairy Costume. These are too cute! It was hard to pick but I think I have to go with the Pink Posy. Love the eletents!! My favorite is the Chinese Flower. Perfect for my little girl coming next month! These products are sooo cute! I love the Rock Star eletent! Fun! I was planning on trying to make one but even better if I could win it!! Love the turquois and blue! My favorite is the pink posy eleTent. We are having baby #3 in March and I would love to finally have one of these cute covers! I love the rockstar tent. So cute! Turquoise and Orange, Jungle Blues, and Rockstar are my favorites! We are expecting our next child in February and the Eletents would be wonderful. My favorite one is Jungle Blues. jessicasmith141 at gmail dot com. I love the blue damask Eletents with matching burp cloths, and the fairy costume for my 3 year old daughter! I love the Diamond eyes! because it could be for a boy or a girl! I love the pink posy eletent! Too cute! I love the Neopolitan Eletent! A car seat tent would be perfect for the February baby that I've got on the way! I like the one in the clearnace section called Camden. They are all sooo adorable!! I love the Pink Posy one! So pretty! Love the eletents, the blue damask is so cute. I love the pink posey eletent. What a great idea and so stylish!!! I love the eletens! The pink posey is so cute!!! the cotton candy eletent is adorable!!! all of this is adorable!! 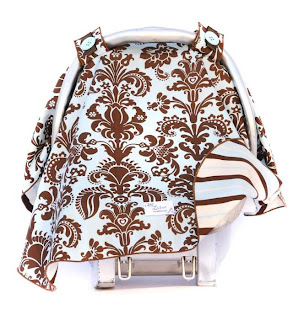 I love the Jungle Blues car seat cover! I love the Neopolitan and the Rock Star covers. I love the pink posey eletent. So cute! I love the Cotton Candy, I am a sucker for anything with circles. I love the Eletents! I am due with our second baby boy on November 20th and would love one. 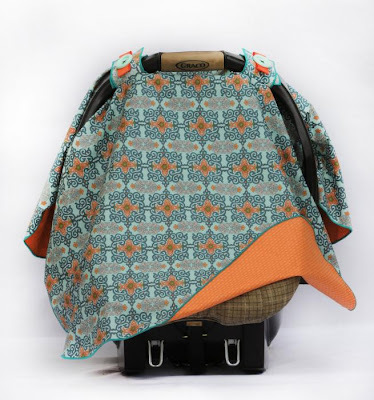 The Orange and Turquoise would match his carseat perfectly! OMG! I love that this converts from the tent to the cover! SO CLEVER!! I am due in January and would love the Pink Posy eletent for my little girl!!! I saw these at farmers market this summer and got a card. I LOVE the Motor Mania and that they turn into nursing covers too is awesome! 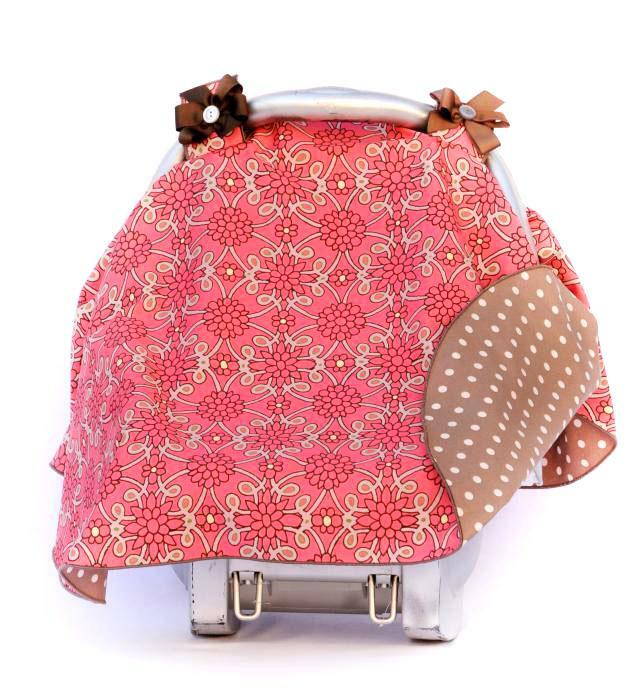 I'm due in March with a little girl and was going to try and make a carseat cover.. it would be nice to win a real one! LOL SO cute and I love that they double as a cover-up too.. so smart!! 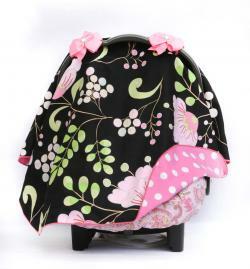 I like the pink posy car seat tent. Very cute. jcgetz at gmail dot com. Those are super cute! My favorite eletent has got to be the cotten candy and neopolitan ones. Love the eletents. I think the neopolitan is cute! After just having twins I could use any of the eletents……but I like the fall bloom and the blue damask best. How darling!!! The pink posey one is sooo cute! They make me 'that much' more excited for our little girl to get here in just seven weeks! i love the fall blooms eletent! i made something similar for my son and we used it SO much. This looks much better than what I put together! I like the rock star ele tent. That would be great for my new little boy. I love the Blue Damask! eletent. Is it girly enough? I'm having a baby girl sometime within the next 5 weeks. It would be perfect! Impressive. I'd definitely use the car seat cover in cold weather. I love two, Tropical Charm and Fall Blooms – but since it is Autumn I think I would favor Fall Blooms. Thank you for the heads up about Eletents! My sister will soon have two under two and I need to get Christmas shopping! I love the Neopolitan. I would get one for my first nephew due in January. I SO need an ele-tent! 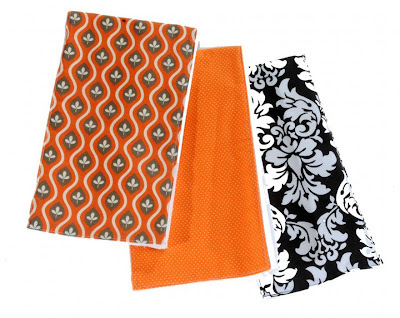 I love hte damask prints … super cute. I love the rock star!! So cute!! Tropical Charm is my favorite pattern for the Eletent. My first grandbaby is due in December so this would be perfect for her! the jungle blue one is so cute! but then again I love the turquoise and orange! These are all beautiful! I love the turquoise and orange and the Chloe! the jungle blues is my favorite. and i absolutely LOVE that they can turn into nursing covers. how wonderful! I am not having a baby, but my good friend is! I would LOVE to give her one of these! I think it would have to be the cotton candy ele-tent. So cute! Ooooo, I have wanted one of these for so long!!!! I love that there are boy options. The Rock Star is definitely fitting for my little guy. What a GREAT idea! I really LOVE the Diamonds Eye! But they are all so adorable! I love the Tropical Charm! So cute and girly! This is such a great idea! I really like the Pink Posey Eletent as well as the Pink Damask. 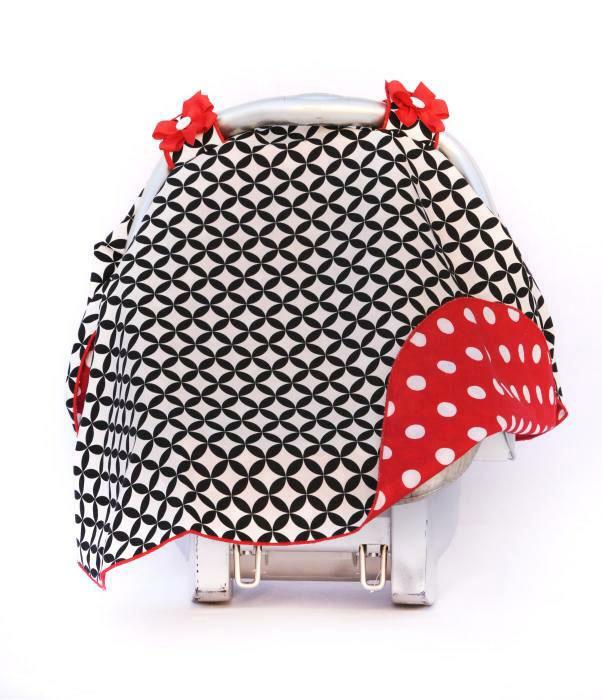 Those nursing straps can also turn an ordinary napkin or one of the burp cloths into a bib for an older baby! Hard to pick, to pick but I think I love the Neopolitan Eletent the best! Love the covers for the car seat! 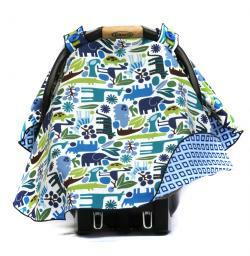 i love the jungle blues eletents…so cute for a baby boy! I really like this idea!! I think my favorite is Neopolitan, but there are soo many cute ones. Love it…turquoise and orange eletent is the one for me! These are just about the cutest covers I have seen! I have so many baby showers coming up and these may be perfect. I might even need one for my son too! I like the MOTOR MANIA the best. Very cute for a "car" seat cover! How fun are these?! I find out what i'm having on the 3rd, and i've been eyeing these things for a while now! I love the Eletents: Chinese Flower, and Rock star. SO CUTE!! I love the cotton candy eletent- just the bright colors look so cute and happy. And I love the nursing strap- what a great idea! Neopolitan is a favorite Eletent of mine! 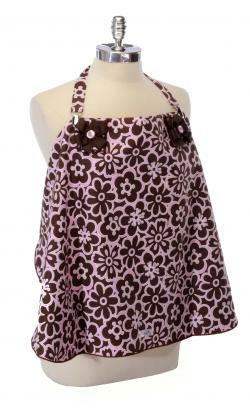 And I love that the strap turns it into a nursing cover! If I am having a girl I would get the Courtney, and a boy the blue damask. So cute! i like the turquoise and orange eletent…i feel like it could work for a girl or a boy. I love the turquoise and orange. I am due in May and we aren't finding out what we're having. This one would work for a boy or a girl. Love the idea! Oh i love the brown damask one!!! I perfect for winter! i am having my little one soon! this will be perfect! I love the Lucas eletent! Such a great idea! Love the eletents love the courtney one. Oh, I love eletents! I would love to get the Blue Geo or Lucas prints for my friend who is finally having a baby boy!